[C]arefully observe all parties involved in a traffic crash, paying particular attention to the behavior, attitude, speech, physical condition, balance and other characteristics that may indicate impairment on the part of any driver. Consult with attending medical personnel to identify any indicators of impairment they have observed and obtain written statements, if applicable. If signs of impairment are observed, . . . at the conclusion of the traffic crash investigation, conduct a criminal investigation to determine if probable cause of DUI exists. 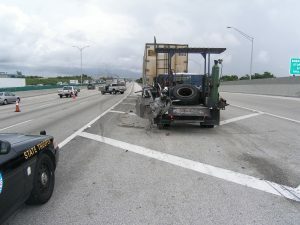 Despite this mandate, the Florida Highway Patrol troopers in this case did not note any signs of impairment exhibited by the driver, did not request that blood be drawn did not find any open containers in his vehicle, did not identify any eyewitnesses that observed him swerving or exhibiting any other improper or erratic driving, did not request that blood be drawn and did not conduct a criminal investigation to determine if he was driving under the influence of alcohol. Defendant previously raised the issue of alcohol consumption in its own motion for summary judgment. In response to Defendant’s motion, Plaintiff filed with the Court the affidavit of Dr. Stefan Rose, a medical doctor board certified by the National Board of Medical Examiners and American Board of Forensic Examiners and trained in General Psychiatry, Clinical Pathology and Forensic Toxicology. Dr. Rose opined that the likelihood of significant errors in the toxicology testing at Broward Health North where the non-party driver was treated renders that testing unreliable and unsuitable for use forensically, and that there was no reliable evidence of his impairment at the time of the accident. Defendant has not refuted or challenged Dr. Rose’s opinions and Plaintiff submits there is no credible or admissible evidence that the non-party driver consumed alcohol prior to this accident or, if he had, that he was impaired in any way. Even if Defendant challenged Dr. Rose’s opinions and presented the Court with admissible evidence relating to testing performed at Broward Health North, the arguments below demonstrate that an inference that the consumption of alcohol contributed to the subject accident or was a proximate cause thereof would require an impermissible stacking of inferences upon inferences and lead to reversible error. Defendant cannot present any evidence of negligence without resorting to speculation and conjecture. It has long been recognized that motorists routinely enter or drive across exit gore areas making the gore area an extremely dangerous environment. Defendant intends to ask the jury to infer that alcohol had something to do with the reason the non-party driver did not avoid clipping the left rear corner of Defendant’s negligently placed mobile service truck. Yet each of the twelve explanations for drivers entering gore areas noted above are equally feasible and reasonable inferences that cannot be excluded. Since all of the potential reasons for the driver’s actions or omissions, including the use of alcohol, can only be inferred through speculation and conjecture, and cannot give rise to an inference to the exclusion of all the other reasonable inferences, it would constitute reversible error to have the jury attempt to reach any inference regarding the negligence on the part of the non-party driver. The law in Florida is well settled that in order to stack inference upon inference, each inference necessary to establish a further fact can only be stacked if the underlying basic inference is established “to the exclusion of all other reasonable inferences.” Voelker v. Combined Ins. Co. of America, 73 So.2d 403, 407 (Fla. 1954); Wilson-Greene v. City of Miami, 208 So.3d 1271 (Fla. 3d DCA 2017); School Bd. of Broward County v. Beharrie, 695 So.2d 437 (Fla. 4th DCA 1997); Hurst v. Astudillo, 631 So.2d 380, 381 (Fla. 3d DCA 1994); Reaves v. Armstrong World Indus., Inc., 569 So.2d 1307 (Fla. 4th DCA 1990). The purpose of this rule is to protect litigants against verdicts or judgments based upon pure speculation, or judgments based upon pure speculation, as would result in this case. Voelker, supra, at 406. The need for the application of this rule of law is demonstrated in School Bd. of Broward County v. Beharrie, 695 So.2d 437 (Fla. 4th DCA 1997), where the school board was sued by a school soccer player who claimed that he was injured because a coach on an opposing team yelled to one of his players to “take him” and “waste him”. Id. at 439. The appellate court recognized that in order to impose liability, the fact finder would have been required to infer that the student heard the statements by the coach and then infer his actions were based on the statements. Id. In reversing, the court concluded that other reasonable inferences could not be excluded and thus an inference of causation required an impermissible and erroneous stacking of inference upon inference. In the our case, a jury could reasonably infer that the non-party driver was not negligent because he was forced out of his lane of traffic by another vehicle, had a mechanical problem with the pickup or because he passed out as he reported to the fire rescue personnel. Similarly, the jury might infer that that the driver was negligent because he entered the gore area after changing his mind about where he wanted to exit or because he was confused by signage. Under these facts, any inference as to whether the driver was negligent, and certainly an inference that alcohol consumption was a cause of the subject accident, would require the jury to ignore all other reasonable inferences and engage in impermissible and erroneous stacking of inference upon inference. The error in submitting issues of negligence and causation to the fact finder under these facts exemplified by the recent decision in Inmon v. Convergence Employee Leasing III, Inc., 243 So. 3d 1046 (Fla. 1st DCA 2018), wherein the widow of a construction workers killed when he was struck by a truck as he walked along a roadway sought death benefits and funeral expenses pursuant to Florida’s Workers’ Compensation Law. Id. at 1047-48. The evidence in Inmon established that the decedent had been drinking at a bar prior to the accident and that the autopsy determined his blood alcohol level was in excess of the legal limit. Id. at 1048. The employer/carrier also introduced a surveillance video that demonstrated the decedent had been weaving in and out of the roadway as he walked and had dropped his phone twice before the accident. Id. The widow testified that her husband seemed intoxicated but functional. Id. The judge of compensation claims (JCC) ruled that the accident was primarily caused by the decedent’s intoxication and denied the widow the benefits she sought. Id. at 1047. On appeal, the district court reversed, finding that the mere fact the decedent was intoxicated was not sufficient to prove the causation issue and that the JCC had impermissibly stacked inference upon inference in concluding the decedent’s intoxication resulted in his being struck in the middle of the road, where another inference, i.e., that the truck struck the decedent when it veered off of the road, could not be ruled out. In our case, there are numerous reasonable inferences as to the reason why the non-party driver’s vehicle was in the exit gore area and why he did not avoid striking Defendant’s negligently placed mobile repair truck. In order to find that the driver was negligent and a proximate cause of the subject accident, the jury will have to choose one of the many possible inferences to establish the basic fact that his entry into the exit gore area was due to his negligence and not some other cause and conclude that its chosen inference has been established to the exclusion of all other reasonable theories. Thereafter, the jury will be required to infer why he could not avoid striking Defendant’s negligently placed vehicle, another inference that cannot be established to the exclusion of any other reasonable theory. Under the facts of our case, the jury’s acceptance of one possible inferences to the exclusion of all of the other reasonable inferences could only result from the jury’s impermissible stacking of inferences and would constitute reversible error.